It’s certainly a treat to see a film that lives up to its hype; that rarely, if ever, happens these days. Anyone who saw Transformers in theaters probably remembers the spooky trailer, showing a bunch of 20-some year old New Yorkers at a party as they hear a giant explosion, go into the street, and see the Statue of Liberty’s head in the street. The trailer cut to black and said 1-18-08. Hype’s been growing over the film ever since, and it’s finally here. The film starts with the same premise as the trailer. Protagonist Robert Hawkins is leaving for Japan, and all his friends are throwing a going away party. His ‘girlfriend,’ Beth, comes for a few minutes, but the two get in a fight and she leaves. Shortly afterwards, an explosion takes place off in the distance, and the head of the Statue of Liberty is thrown into the middle of the street. That’s all I’m going to tell you; I’m sure readers have already become aware of other plot elements, but I tried to stay away from finding out plot details, and the film was very enjoyable because of it. Yes, this is a monster movie. But this really is a special monster movie. The premise is that everything we’re seeing was recovered at the area of Manhattan formerly known as Central Park. This footage, as we see, is being shot on a hand cam by Rob’s friend Hud, who wants to document the horrific events. This really brings a depth to the movie; there have been plenty of giant monster stories, but what sets “Cloverfield” apart is how personal it gets, being filmed by the protagonists. You can tell the creators of the film really thought about how the movie would be shot; every frame does burst with creativity, not only feeling like someone with no experience filmed it, but like they filmed it in the middle of a monster attack. Some will dislike the shaky camera and will wish they shot this normally, like Independence Day or the Godzilla films. However, if it had been shot like that, I highly doubt anyone would be praising this film as anything special. Nevertheless, I’d still recommend sitting further back from the screen than you’re used to. Most reviews have said this film is essentially Godzilla meets “The Blair Witch Project.” Now, I can understand that Godzilla part...the monster is a giant lizard, but beyond being shot by the characters and recovered after the end of the story, this film really bares no resemblance to “The Blair Witch Project.” Please allow me to take this opportunity to praise “Cloverfield” and vent my hatred of “The Blair Witch Project” by giving some reasons why “Cloverfield” is superior. 1. “Cloverfield” has a plot, with well developed characters that we care about. 2. Every scene in “Cloverfield” serves a purpose, either to move the plot along, grow character development, or to excite and frighten the audience. Every scene in “Blair Witch” is essentially three people yelling at each other while walking around the forest. 3. While still somewhat unbelievable that the Protagonists would be filming the monster’s rampage, it still makes more sense than why the characters in “Blair Witch” want to film themselves arguing in the middle of a forest. The camera gimmick really enhances the “Cloverfield” film. 4. “Cloverfield” is genuinely exciting, spooky, and unsettling on many levels, and it’s not even supposed to be a horror film. “Blair Witch,” classified as a horror film, is only scary to those with a phobia of watching whiny teenagers argue in the middle of a forest. 5. “Cloverfield” really advances the genre of action/monster flicks with its originality. “Blair Witch” sets the horror genre back about 30 years. Alright, I’ll stop. I just hate it when a really good film is compared to one of the worst movies I’ve ever seen. If you like “Blair Witch,” that’s fine with me, but don’t go seeing “Cloverfield” expecting it to be like “Blair Witch,” because it isn’t. “Cloverfield” isn’t perfect; it’s a tad too short, at only 75 minutes (without credits), but I expect that if it had been longer, it would have probably felt like it was dragging. As it is, the film’s pacing is pitch perfect, and I’m glad they didn’t upset it by adding in scenes just to make it longer; but you do have to wonder if it could have worked with ten more minutes of action around the middle. Of course, the most disturbing thing about this movie wasn’t the monster; it was that this film was released in January. Movies this good are NEVER released this early in the year. A nice surprise for avid filmgoers who have to stop going to the theater the first three months of the year. 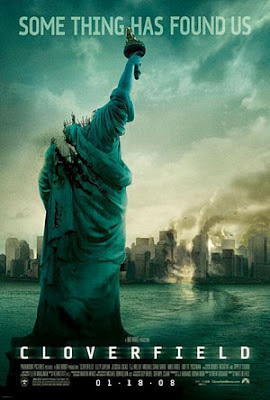 “Cloverfield” certainly lives up to all the hype, and for me at least, surpasses it. This isn’t “The Godfather,” but is a creative, extremely well done thriller. Just don’t sit too close to the screen.